Dugroz: They Rushed Me to the E.R. for . . . A Stuffy Nose? They Rushed Me to the E.R. for . . . A Stuffy Nose? think much of it, settled in for a normal evening and slept fine that night. I felt a bit of the same getting ready for work Monday AM, but nothing that would keep me from going to work. My job involves talking over the phone all the time, so shortness of breath and/or excessive stuffiness can be a real bummer. By 3 PM, it was coming back and clearly interfering with my ability to do my job. Again, nothing all that unusual, this kind of thing usually comes up 3-4 times per year. By 4:15 I called it a day, and decided to head home early (for those of you not aware, I usually work from late morning until about 8:10 PM). On the way home I debated with myself the merits of going to see a doctor. While my condition was a little worse than a normal asthma flair up, it wasn't much. However, knowing that I was missing work anyway, it was probably as good of a time as any to go see a doctor. The last thing I would want is to sit around all day, then need to miss MORE work later to go to a doctor. So, I went on to the urgent care in Ankeny. After waiting quite a while, I got in to see a nurse practitioner eventually. She listened to me breathe, and agreed with me that my heart was beating a bit harder than normal (this is also common with an asthma flair up). As a precaution, she ordered a chest x-ray and an EKG. Both of those done, (now I've been at urgent care for nearly two hours) I resumed waiting in the little room alone for about 30 minutes before hearing anything at all. Then a doctor came in (noteworthy that it was "the doctor," not the nurse practitioner this time). He asked me all the same questions that the nurse and the nurse practitioner asked me. There was a lot of hemming and hawing around, and finally he said, in essence, that he was concerned because the EKG showed a "funny looking blip." That, plus a family history of heart problems led to him calling the ambulance for me. The purpose was to take me to the emergency room so that they could run some blood tests that they don't have the ability to run at urgent care. Whoa ... wait a minute. Seriously? Other than some minor breathing issues, and some fatigue, I actually felt normal. No hoarseness, wheezing, sore throat or anything like that. Can't I just go home and have my wife drive me there? No, I can't let you drive home. Why? Well, although the odds are very small, the "funny" EKG reading could be caused by several things, and one of those things is cardiac arrest. Another very small possibility is that you have a blood clot in your lung. Well, what else could it be? It could be - and probably is - something much more minor, like just a bad reading (ie, a "false positive"), or a staph infection could cause this kind of result, or certain kinds of viruses can, or a variety of other rare (yet minor) things. But essentially, you're saying that I MAY be having a heart problem or blood clot right now (tiny chance), and for that reason I can't drive and I need to go to the ER immediately? Yup. 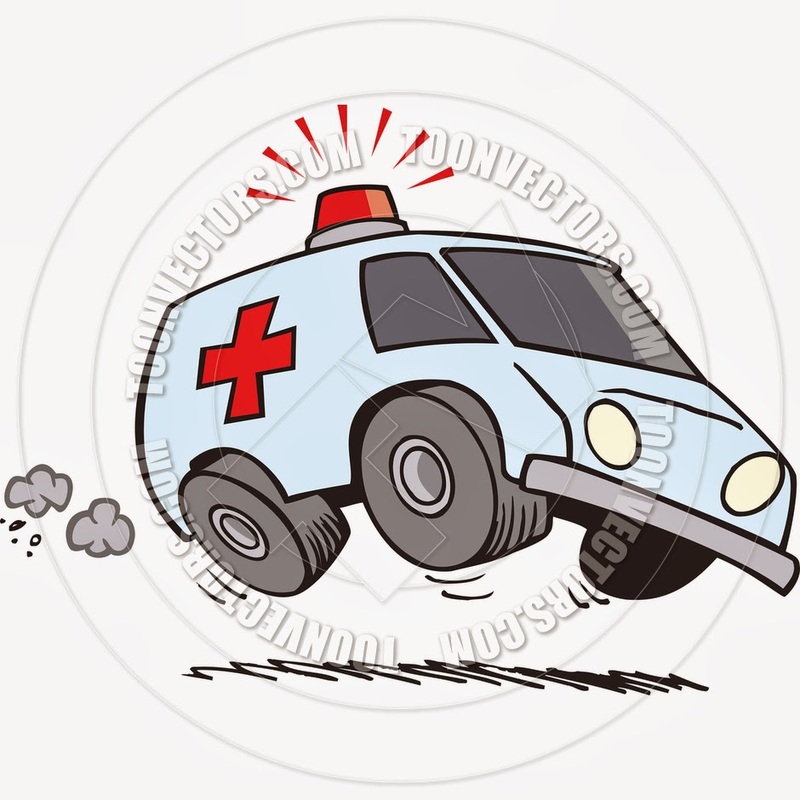 Well, the Ankeny Fire Department isn't far from urgent care, so I really only had about 5 minutes to use the bathroom and call Debbi to tell her the very brief version of what's going on (poor wife!). Then, 3 paramedics came into the room and asked me all the same questions the nurse, NP, and doctor had asked me. "Do you think you can walk to the gurney [10 feet away] under your own power?" "Well, I can just walk to the ambulance perfectly fine, actually." "We're really not supposed to let you do that." Long story short, I was greeting at the ER (Methodist Hospital) by a nice nurse and a nice PA who went over all the test results so far, and took a 3rd EKG, hooked me up to a heart monitor, and ordered a bevy of blood work. So, in the long run, I described my symptoms to (1) the nurse at urgent care (2) the nurse practitioner at urgent care (3) the attending doctor at urgent care (4) the paramedic who came in first at urgent care (5) the paramedic in the ambulance (6) the nurse at the ER, and (7) the Physician's Assistant at the ER. The final diagnosis with the blood tests was a bad reading on the preliminary EKG. She explained to me that the EKG only takes a snapshot at one point in time, and, just like any machine, it can mess up. The 2nd two EKG readings were clear as a bell, no problems whatsoever. The heart monitor was fine too. In fact, she was able to tell me, you have definitely never had a heart attack, you're definitely not having a heart attack right now, and you definitely don't have any blood clots. The official diagnosis was "Upper Respiratory Infection with Asthma Flair and Shortness of Breath." I was given a prescription for Prednisone and sent home right away. Debbi got there about that time to drive me back. Thanks to Aunt Pam for watching Ben & Joe while she was coming to meet me. I'm feeling fine this AM other than a little fatigue and still some chest tightness and shortness of breath. I will have a follow-up with my regular family doctor in about 1 week, just as a precaution. An funny observation is that the ER I went to (Methodist Hospital) is about 1 block from where my work parking garage is. If I had just walked into the ER, I could have driven myself home, saved the ambulance ride, saved Debbi having to come get me, and saved us from having to go get my car from urgent care this AM (Tuesday). Oh well. My take on the whole thing was that this was nothing more than "just incase" prevention mode. Once a doctor sees a reading on an EKG that indicates ANY chance of a risk, he just can't send you home no matter how tiny that risk is. On one hand, I appreciate the abundance of caution. On the other hand, the whole exercise seemed very pointless. I have a friend who works at a hospital. After I summed up the events of the night, his comment was, "defensive medicine is the bane of efficient/affordable healthcare." 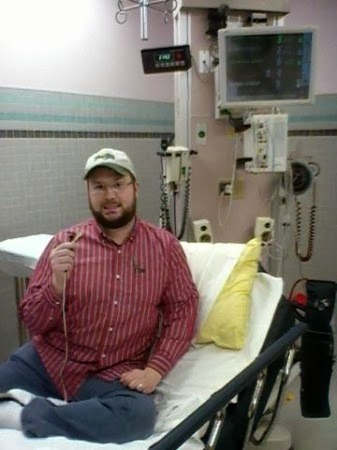 Just before I left the ER, holding the monitor wires that were hooked up to me.